Beets can germinate in soil temperatures as low as 50 degrees, making them ideal for the early spring and fall vegetable gardens. Beets don’t care for overly acidic soil, so gardeners should perform a soil test before planting to ensure that the pH is between 6.2 and 6.8. If the soil is too acidic, add lime until the pH is properly adjusted. 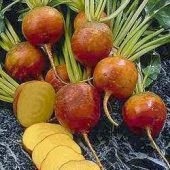 Table beet (also known as garden beet, blood turnip or red beet) is a popular garden vegetable throughout the United States. Beet tops are an excellent source of vitamin A and the roots are a good source of vitamin C. The tops are cooked or served fresh as greens and the roots may be pickled for salads or cooked whole, then sliced or diced. Beet juice is a basic ingredient of Russian borscht. 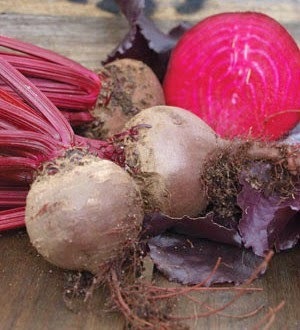 The garden beet is closely related to Swiss chard, sugar beet and mangel. The beet "seed" is actually a cluster of seeds in a dried fruit. Several seedlings may grow from each fruit. Plant seeds about 1/2 inch deep and one inch apart. Allow 12 to 18 inches between rows. Poor stands are often the result of planting too deeply or the soil's crusting after a heavy rain. The seedlings may emerge over a relatively long period of time, making a stand of different sizes and ages of seedlings. Some gardeners find that placing a board over the row after planting preserves the soil moisture and eliminates crusting from hard rains. The board must be removed as soon as the first seedling starts to emerge. When harvesting beets, separate the green tops from the roots leaving an inch of stem on the beet. Beets larger than 3 inches in diameter are often fibrous and woody. Beet greens are packed with nutritional value but must be prepared separately. Upon storage the greens will quickly draw the moisture from the root greatly reducing flavor and the beets will become shriveled. Leave one inch stem and the taproot intact to retain moisture and nutrients. After separating, beets store well for about a week in the refrigerator. 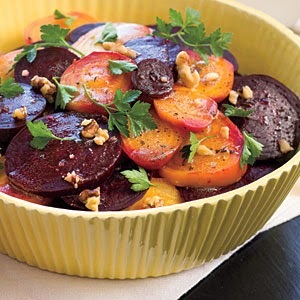 Use beets while they are still firm and fresh. Good for adding minerals to the soil. The leaves are composed of 25% magnesium making them a valuable addition to the compost pile if you don't care to eat them. Beets are also beneficial to beans with the exception of runner beans. Runner or pole beans and beets stunt each other's growth. 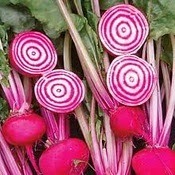 Companions for beets are lettuce, onions and brassicas. Beets and kohlrabi grow perfectly together. Beets are helped by garlic and mints. Garlic improves growth and flavor. Rather than planting invasive mints around beets use your mint clippings as a mulch.